Both matches at the Irish Open in Fitzwilliam LTC went the distance…..and what drama we had in both finals. The women’s final started with an edgy first set with Englishwoman, Millie Tomlinson, finding good length. Nele Gilis from Belgium, looked nervous taking time to settle. Millie – last year’s winner – was in the ascendency and had come through her previous matches without dropping a set. Millie won the first set 11-2. The second set saw a different player in Nele. She started to find good length and Millie was the one who looked a little out of sorts. Nele found herself with a 7-1 lead before Millie got back into the game. The pace of the game increased as Millie began to volley more and put her opponent under increasing pressure. At 8-9 a long rally ended with Millie hitting the tin. This gave Nele the confidence to go on and win the set. The third set took just 10 minutes with both women hitting outright winners and an equal amount of unforced errors. Millie won 11-7. The fourth set was the game of the match with both players playing to their potential. The lengths on the backhand were tight and exacting and the retrieving was superb. Millie led 8-6 and appeared to be on track for a second successive Irish title when Nele won the rally of the tournament. She followed this with two more excellently constructed points giving her a 9-8 lead. Nele came back to level at 9-9 and won the fourth 11-9. The final set saw Nele demonstrate her incredible court speed chasing down everything from the start of the set. At 1-2 she began to volley more winning six points in a row. Millie had lost her length that had given her two sets and was struggling in the rallies. With the score at 7-4 Nele produced three winners giving her match ball. She didn’t require a second…………and the Irish Open title of 2017 was secured. The men’s game was contested between the number two seed, Declan James, and the number three seed, Adrian Waller. Both men are from England and both are over 6ft in height. Adrian is a left-hander which resulted in a lot of cross-court shots from both players. After the first ten minutes the crowd knew that the referee was going to earn his money this afternoon. The opening set was very tense and peppered with a series of lets, strokes and no-lets. A nervous Waller went 6-2 down and appeared out of sorts. He recovered and got back to 7-8 before James finished out the set with some outstanding drops. The second set saw the referee called on continuously to make decisions. However, Adrian – who was calling for most of the decisions – began to find form and controlled the game winning the set 11-6. Maintaining the same form in the third Adrian won 11-3. The same pattern emerged at the beginning of the fourth set with Adrian increasing the pace with a string of volleys and drops on Declan’s backhand. At 5-2 down Declan looked as though he was going to be runner-up for a second year in a row. However, he began to find a better length and increased the duration of the rallies. Adrian appeared to tire a little and lost the edge to his winning game. With Adrian needing to change the game pattern, Declan won 9 points without reply and secured the fourth 111-5. The crowd at this stage were eager for the fifth set. Who would be the victor in this contest of giants. At 2-2 Adrian appeared to lose his focus after a discussion with the referee and went 8-2 down, Declan was playing some fantastic squash and the retrieving at the front of the court was brilliant given the height of both men. With Adrian losing focus and having several chats with the referee Declan began to urge the crowd to support him after winning an amazing rally. With a series of errors from Adrian – 5 tins in seven rallies – Declan was 10-3 up with seven match balls. Adrian decided to go for broke and played some outrageous winners saving 5 match balls. With the score at 10-8 Adrian went for an overhead crosscourt nick. It clipped the top of the tin and Declan was the Gillen Markets Irish Open Champion. Semi final day at the GillenMarkets IRISH OPEN. Current women's champion Millie Tomlinson was up first, playing Dutch champion Milou van der Heijden. Millie started very well, hitting a super length from the start. She raced to a 8-2 lead. Milou got another 3 points but Millie won it 11/5. The 2nd was much closer with the 2 players trading point for point. They both were very tight and making few mistakes. Millie took a tight 2nd 11/8. The third was exactly the same but van der Heijden let a gap grow a little and Tomlinson finished it off well 11/8 to win 3-0 in 36min. The other women's semi final between Julianne Courtice and Nele Gilis was an incredible match. The balance swayed between both players and was a true display of how squash should be played. Gilis won the first 11/6 and looked in full control. Courtice came right back into it in the 2nd and 3rd winning both. All four corners of the court were being used and the players strength was truly tested. Courtice led the 4th 5-0 and it looked ominous for Gilis. Nele dug deep and Julianne made a few mistakes; Gilis takes the 4th 13/11. So onto the deciding game. It went to 5 all. Gilis shot making now started to stretch Courtice and Gilis won the 5th 11/5. A super semi final for the huge crowd. 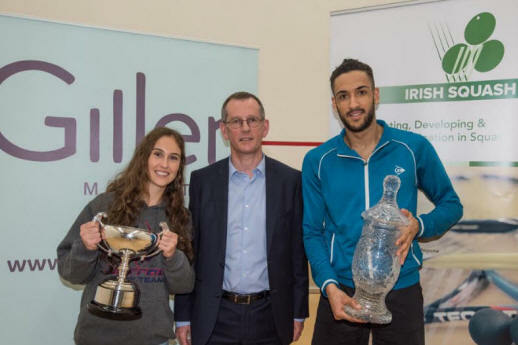 In the men's semi finals, Adrian Waller player Yoissef Soliman, the winner in the West of Ireland PSA Open last week. They had not played each other before. Waller game plan was to make it tough for him, as he had a tough week playing a lot of squash. Waller was very controlled and nearly looked in slow motion at times, such was his movement and length. Waller won the first 11/7. In the second he was even more dominate and reeled off 9 points without reply, to win the second 11/1. In the third Soliman came back at him a bit in the middle. Waller just settled himself and took it on again to win relatively easily 11/8 and 3-0 in 40min. The last match of the night was another cracker. Last year's beaten finalist Declan James of England played Egyptian, Mazen Gamal. Both players were very tight in the first game and there was nothing in it. James made a couple of lovely winners and forced some mistakes from Gamal to win it 11/7. Gamal settled into the 2nd game and started to find a better length. He led 5/2 before James then got 5 points in a row. James was forcing Gamal now and won the 2nd 11/7. The 3rd followed the same pattern except at the end of this game Gamal was getting the shots, with James now making some mistakes. So 2-1 to James with the crowd willing another 5 seter. 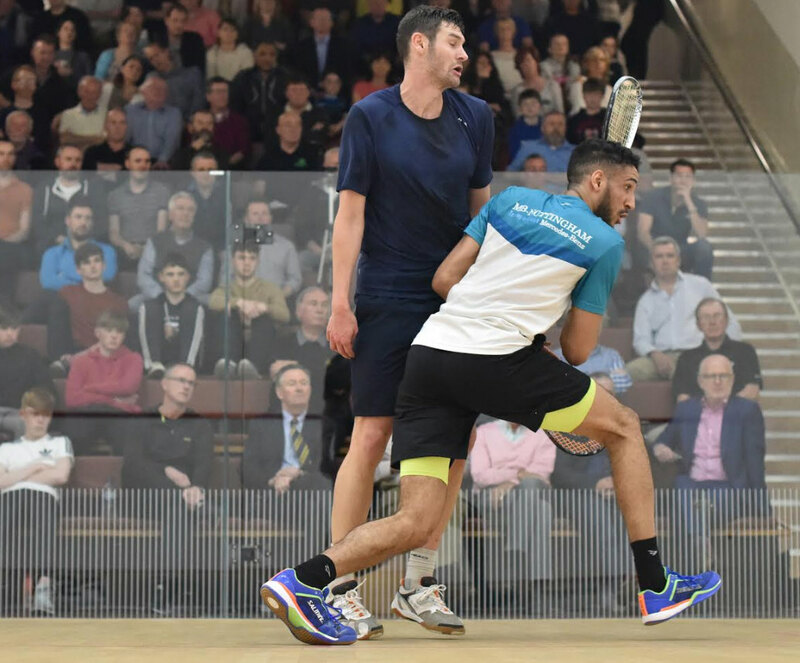 Gamal started to look a little tired and James went into a 7/4 lead before Gamal reacted but not for long, as James turned it up once again to win 11/5 and 3-1 in 64min. So a night of superb semi finals and we now look forward to 2 super finals tomorrow. Quarter finals day at the GillenMarkets IRISH OPEN saw some super matches. First match of the day was between current champion, Millie Tomlinson of England and Chloe Mesic of France. Millie was in great form and was ruthless in her approach. She didn't give Mesic a chance. The score was 3-0 and the champion looks to be determined to hold onto her title. In the 2nd of the Women's quarters, Dutch No.1 Milou van der Heijden played Mexican and former top 20 player, Samantha Teran. This was a really sporting contest, played honestly between the 2 players and most enjoyable for the large crowd. Milou won a close 1st & 2nd game and Samantha the 3rd. The rallies were nip and tuck with nothing to choose between the 2 players. The 4th game was exactly the same with each point going to one player and then the other. In the end, Milou got it 11/9, but it could very easily have gone the other way. A super match! The next women's quarter was somewhat different with Hana Ramadan & Julianne Courtice really going at each other and the referee. A lot of decisions were argued over. There was some very competitive squash and Courtice won the 1st game 11/8. In the next game Ramadan had 3 game balls but lost it 14/12, a game which lasted 17 min alone. The 3rd was similar but Ramadan ran out of steam and it finished 11/8, so 3-0 to Courtice. The last quarter final was a classic match between No.2 seed Nele Gilis and Amanda Landers Murphy. Must be some Irish blood there somewhere! This match lasted 78 min and had the crowd enthralled. The first 3 games were very close with some super striking of the ball and movement by both players. Gilis went 2-1 up. The 4th game was really super with Landers Murphy requiring 3 game balls before she won it. She looked a bit tired when she came out in the 5th and Gilis went 7/1 up very quickly. Amanda then rallied and brought it back 4/7, but Nele went again and won it 11/4 to win the match. A really great match. In the men's quarters the No. 1 Abdulla Mohd Al Tamimi played Youssef Soliman. Tamimi went 2-0 up but Soliman wasn't finished and he worked really hard to win the 3rd 14-12. Tamimi lost interest in the 4th immediately and lost it in 3 min, 11/2. Tamimi won the 1st two points but then Soliman took over again and won it 11/6. The second men's quarter was tough with Ben Coleman & Adrain Waller going at it from the start. Waller beat Irishman, Arthur Gaskin last night. The 1st game went to Waller 11/5. In the 2nd & 3rd there was very little between them, but Waller came out the victor, winning them 11/8, 11/9. Coleman wasn't happy with some of the referee decisions and lost a bit of focus, certainly at the end when he lost the last 7 points without reply. The match between Egyptians Shehab Essam & Mazen Gamal started at a great pace with both players hitting the ball very hard and to a length, with very few shorts shots. It looked as if it was going to be a slugging match. Essam won the 1st game 11/9 in 18 min. Gamal then started to mix it up a bit and it paid dividends, as he won the 2nd and 3rd, 11/4, 11/1. in the fourth Gamal raced into a 6-0 lead. Then at 8/1, Essam lay down on the court and didn't move. Thankfully 2 doctors in the crowd attended to him immediately and medics arrived to look after him. He came round and was medically checked and walked off the court, thankfully OK.
Englishman Declan James & Todd Harrity from the USA had a tough 1st game with both players playing to a high tempo. Harrity battled to win it 12/10. James settled into his game in the 2nd, playing some lovely drop shots to win it 11/8, the 3rd was more of the same, so 2-1 to James. In the 4th Harrity lost concentration and James raced into 7/2 lead. Harrity tried but couldn't stop James winning it 11/4 and the match. Irish players Hannah Craig and Arthur Gaskin, both went out of the GillenMarkets IRISH OPEN today. Gaskin played Adrian Waller the WR No.38 and went 2-0 down. Arthur rallied and won the 3rd and had 2 game balls to win the 4th. However Waller dug in and got the win 3-1. The Junior, Hannah Craig from Belfast played Hana Ramadan from Egypy and lost in 3 games to the much more experienced player. In all there were 16 matches in the Women's and Men's first round. 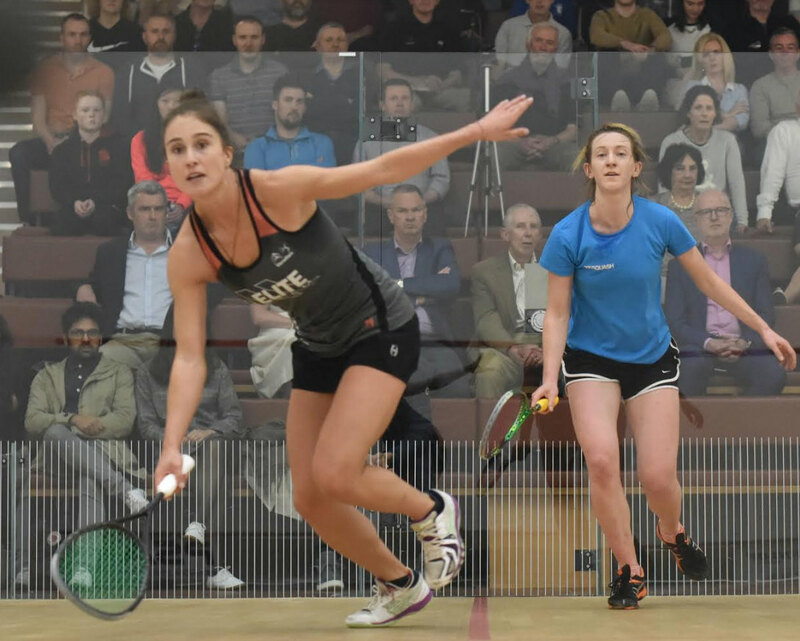 The number 1 seed in the women's draw, Millie Tomlinson, the reigning champion had a straightforward win over the young Belgian player Tinne Gilis 3/0. The No. 2 women's seed Tinne's sister Nele made sure the family were in the 2nd round, with a good win over Latvian qualifier Ineta Mackevica, 3-1. It was a good competitive match and Mackevica ranked 50 places behind Gilis played very well. Last year's finalist Rachael Chadwick gave the crowd full value for money with her passion and running commentary during the match. It went to 5 games and was very close with Julianne Courtice winning the 5th, 12/10. Former top 20 player Mexico's, Samantha Teran had a good win over Czech qualifier Eva Fertecova 3-0. In the men's round 1, Number 1 and 2 seeds, Abdulla Mohd Al Tamini and Declan James both had 3/0 wins. Neither had too much bother but it took James 53min to put India's Mahesh Mangaonkar down 3/0. There were some super rallies in this match. The higher ranked Charles Sharpes from England had a tough match with a lot of debate with the referee. Playing Shehab Essam from Egypt, Sharpes won the first 11/ 9, but had a tough 3 games to follow and lost 3/1. The No. 7 seed Youssef Soliman from Egypt had a super match with Dane, Kristian Frost. Soliman won the first and it went back and forth to 2 all. Frost worked very hard to stay in it, versus the higher ranked Soliman and in the 5th it showed, where he lost it 11/3. This match lasted 80 minutes and the crowd got great entertainment. Round 2 starts tomorrow at 12 noon again. In the first of the three women's matches on today, we had number 1 seed in the qualifiers Tinne Gilis playing the South African Makgosi Peloakgosi. In a competitive match, Tinne came through in 3 games. She played some very tidy squash and now plays number 1 seed and defending champion Millie Tomlinson tomorrow. The next women's match was between Czech Eva Fertekova and Swiss player Nadia Pfister. Both players started nervously and made several mistakes. Nadia started marginally quicker and won the 1st game 11/6. Eva settled into the match and won the next 2 games well to 4 and 6. Nadia playing better squash at this stage, leveled it to 2 all. The last game was marred by mistakes from Nadia which cost her the match; losing the 5th 11/9. With Farah Momen withdrawing, it meant Tessa Ter Sluis had a bye into the main draw. The last match was between the Scot, Elspeth Young and Latvian Ineta Mackevica. Ineta used her height advantage to good effect over Elspeth winning the first game 11/6. The Scot started the 2nd & 3rd games well and was up in both but Ineta finished the stronger in both to win out 3-0. In the Men's event the first match was between number 1 seed Carlos Cornes from Spain and Ondrej Uherka from Czech. The first game was a cracking one with it going over and back until it got to 14 all. Both players were playing very well and the rallies were super to watch. Uherka won it 16/14. The 2nd was all Cornes and he won it 11/3. The referee had to work hard with many of his decisions being questioned by both players. Again the last 2 games were grueling with many long rallies but Uherka came through to win both 11/9 & 11/8. The 2nd match up between Jens Schoor from Germany and Mohd Syafig Kamal from Malaysia was a much more straightforward affair with Schoor winning well 3-0. Kamal never really got into it. The match betwen Scot Douglas Kempsell and Belgian Jan Van Der Herrewegen, who beat Irishman Brian Byrne yesterday, was a super match. There were really long rallies and some really good short play at the front. Even though it ended up 3-0 to the Scot, the match was close and lasted 50 minutes. Kempsell retrieved beautifully on occasions and then played some lovely drops immediately after. The last match between the two New Zealanders Evan Williams and Ben Grindrod was a rather short affair, with Williams winning comprehensively in 25 minutes. Grindrod was never in the match really, despite rallying somewhat in the 2nd. But it finished with a 3-0 win for Williams. So onto the main Draw tomorrow, which starts at 12 noon on Court 1 and 2. The first day of the GillenMarkets Irish Open 2017 started today at Fitzwilliam LTC in Dublin. Unfortunately, none of the Irish players won their matches despite good performances. Unfortunately a couple of the women entrants withdrew late leaving us with only three women's matches. Irish players, Sophie O'Rourke and Ciara Moloney both competed well but lost out to very good opponents, Eva Fertekova and Elspeth Young. In the men's event Sean Conroy got injured in his match v Jens Schoor of Germany and had to retire in the first game. Brian Byrne played with his usual energy and skill however his opponent Jan Van Den Herrewegen, world ranked 89 played really well and won the first two games 11/6 & 11/3. The third game was much closer with the game going back and forth. With Van Der Herrewegan tiring, Brian had a chance, but just couldn't get over the line. So it finished 3-0. Douglas Kempsell of Scotland had a super win over George Parker, having been 2 games down. In a 74 minute match, Kempsell dug in well and won the last 3 games to win 3-2 in a hard fought match. In the all New Zealand match Ben Grindrod beat the higher ranked Lance Beddoes 3-0 in convincing fashion. Another lower ranked player Ondrej Uherka of the Czech Republic beat Tom Ford of England 3-1. Tom leveled it one-all but Ondrej finished the 3rd game strongly and in the 4th won 8 points in a row, to win the fourth 11-3. The other two Irish players in qualifying, Conor O'Hare and junior Scott Gillanders both had tough matches. Scott lost to Malaysian, Mohd Syafig Kamal 3-1. A great experience for Scott, which will stand to him for the future. In the last match Evan Williams had too much for Conor O'Hare and won 3-0. Qualifying finals start tomorrow at 12 noon.